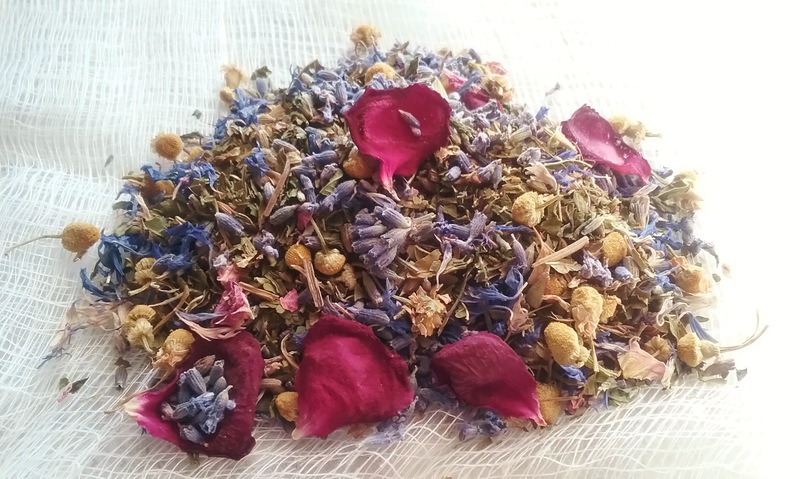 Mountain Rose Herbs makes a caffeine-free bulk tea called Evening Repose Tea that I have gotten in the habit of enjoying in the evening. It’s a relaxing balance of peppermint and spearmint, chamomile and cornflowers, lemon verbena, lavender, rose petals and organic stevia. But once the summer heat cranked up, hot tea no longer held that same appeal. I hit on a solution that has become my go-to iced tea during the day and well into the evening. Still a sun tea of sorts, I’ve ramped up the process just a tad. Instead of leaving the tea to steep outdoors via the sun’s rays for an entire day, I gently pour boiling water over the bulk tea wrapped in cheesecloth and set it out in the sun for a couple of hours. It’s just enough time to infuse yet remain well-balanced, clear, and very refreshing. Once I got with the program, I’ve come up with other variations. One of my favorites is simply to boost the lavender and rose values by tossing in a bit more of it from a pretty bowl I have drying on a nearby table. Add ice, perhaps a little lemon, sugar if you must, and life is good. Wrap the bulk tea in 2 layers of cheese cloth and tie securely with culinary twine. Place in 2 quart container with lid. 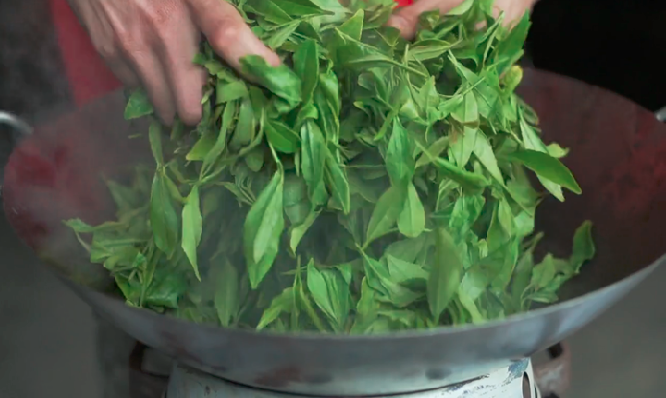 Gently pour boiling water over the tea, loosely cover and place in the sun for 2 hours. 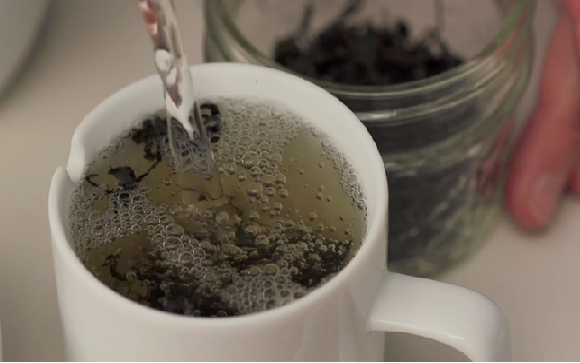 Remove the tea bag and pour into a storage container. When cool, chill and serve with ice and lemon slices. Serves 4 or more. Here in the Pacific Northwest we are known for our extreme coffee consumption. At any time of the day or night, drive down a busy street and you will likely find multiple drive up coffee stands positioned to service the staggering number of customers queued in line for their next quick fix. And when it comes to heat waves, rather than sweet tea, iced coffee is often our drink of choice. 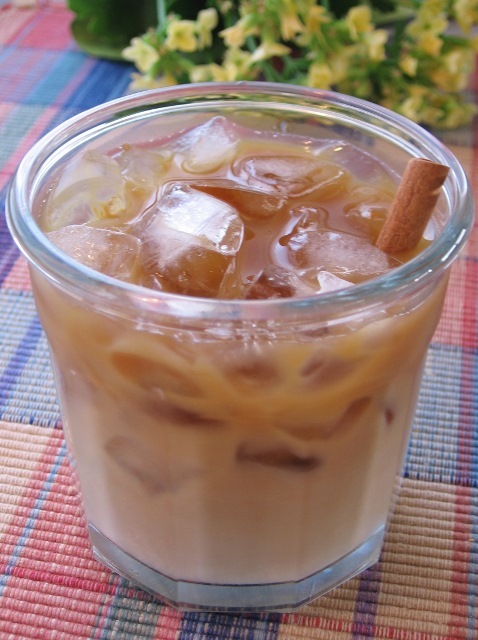 With temperatures soaring over 100 degrees for multiple days recently, my friend Chuck’s house specialty is a refreshing Thai iced coffee. He suggests sugar muddled in a glass with a spiced coffee base, filled with ice cubes, and finished with half and half to taste. Of course this took me right back to my coffee days in the Bahamas and Caribbean. Since fresh milk was considered a luxury that required refrigeration, condensed milk was often favored due to its greater shelf life. So popular, it was also served in most cafes and restaurants; after a while its taste just became part of the experience. Since I’m not a big fan of sugar in my coffee anyway, I opted to stay with tradition and go with my old standby, sweetened condensed milk. If you are a blog follower, then you are likely familiar with other recipes here praising its virtues, like Key Lime Pie and Dulce de Leche. Its light caramelized flavor adds a richness, it rounds out, and enhances the cardamom and cinnamon flavoring brewed into the coffee base – it’s that simple. Just add ice! In basket of a coffee brewer, place ground coffee, cardamom and cinnamon. Brew with water and allow to cool. In individual glasses add 1-2 tablespoon sweetened condensed milk and thin with 1-2 tablespoons milk. Add ice and pour in cool or chilled coffee; top off with additional milk as desired. Garnish with a sprinkling of cinnamon or a cinnamon stick. Serves 4. Old fashioned shrub is a lively vinegar based drink gaining popularity as a mixer for alcoholic and non-alcoholic beverages. 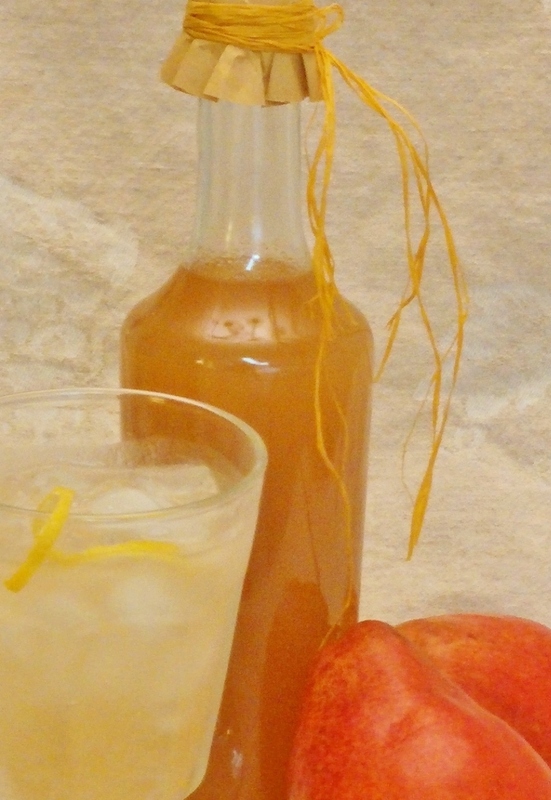 A basic shrub syrup is made from fresh fruit, other flavorings, and vinegar. Before refrigeration, the acid in vinegar was considered a preservative for the fresh fruit syrup, ensuring it would improve over time. 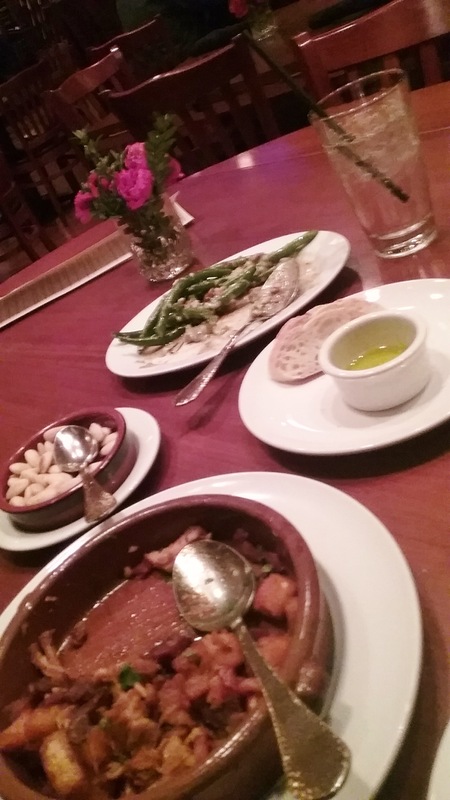 Herbs, spices, and other additives were often introduced not only to add character but to mask potential off-qualities. It is thought that one of the first American cocktails probably included a shrub syrup with either rum or brandy. Some health proponents regard vinegar-laced beverages as a restorative and even beneficial in weight loss. Over a year ago, I mentioned my initial shrub experience here while visiting the Austin farmers’ market. I was especially intrigued by the yin-yang effect of an Apple Lemon Ginger version—in the Texas heat, it was a nice change and highly refreshing. 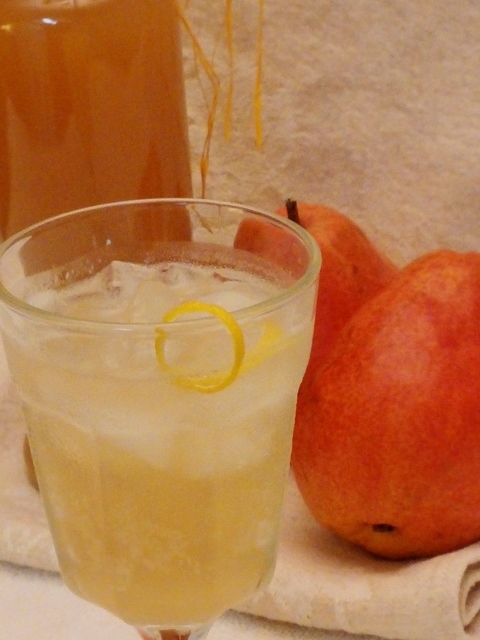 Since it’s pear season I decided to try my hand at making a batch and am amazed at how easy and tasty it turned out. I learned it’s important to use ripe fruit, a few bruises will not affect the end results. 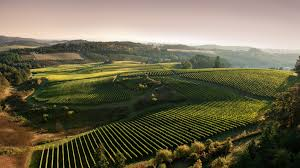 The amount and type of sugar and vinegar will depend on the fruit’s sweetness as well any other flavors introduced. The comice pears used were sweet and juicy with abundant pear flavor and a whisper of floral notes. I decided to incorporate ginger and lemon again; flavors I suspected would support and enhance the pear’s. After tasting champagne wine vinegar and two types of apple cider vinegar, I opted for a mild and fruity apple cider vinegar with 5% acidity opposed to the champagne vinegar’s 7%. I opted to combine the peeled and chopped fruit, grated ginger and lemon with the sugar and let it stand in a cool place for well over 24 hours; enough time for it to soften and blend together. I added an equal amount of vinegar to the mix, combined it all and placed it in the refrigerator to blend and mellow for a couple of days. I checked on it daily and noticed a decidedly more integrated quality each day. On the third day, I ran the fruit through a fine sieve. The syrup was a gorgeous coral color, which I did not expect, it had the true essence of the pears, the ginger and lemon gave just enough to balance and highlight the fruit. I spent way too much time dithering over the cloudiness of the syrup with coffee filters and sieves. After considerable debate, I decided it was way too good to extract well over half for the sake of clarity. Still, the fruit residue left behind looks much like pureed applesauce, and is just about the best thing I have ever tasted. Much like a gourmet uncooked pear butter, I have eaten it with yogurt, by itself, and even spread on toast. The shrub syrup is just as good, shouting sublimely pear in tandem with a sprightly tart boost. 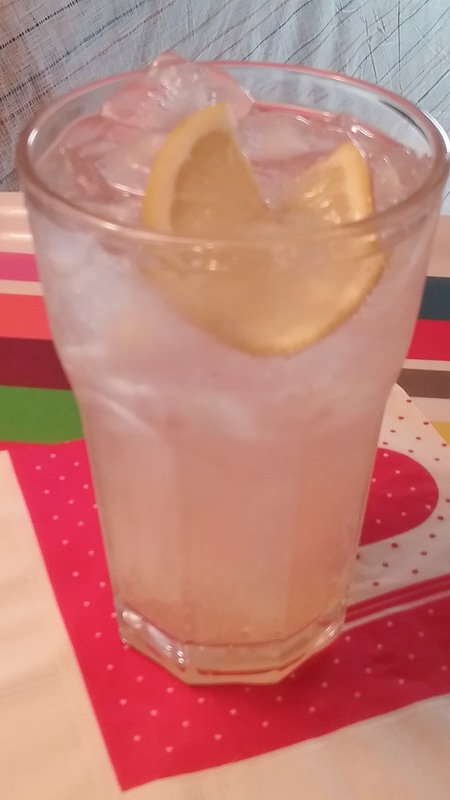 Thus far, I have mostly enjoyed it over ice, topped with sparkling water and a good twist of lemon. After a couple of sips, I’m energized and revitalized. Seriously. You be the judge. In a large, clean bowl mix the chopped pear, ginger, and lemon peel with the sugar and combine well. Cover with plastic wrap and store in a cool place overnight. The next day, give the pears a quick stir to dissolve any sugar and add the vinegar. Let the pears rest a day or two in the refrigerator to develop flavors. Stir the mixture again, pour it through a fine sieve to strain, pressing to release as much liquid as possible. To remove cloudiness, if desired, strain again through cheesecloth or a coffee filter. Transfer to a clean jar or decorative bottle. Store in refrigerator up to 3 months. Discard if bubbling or signs of mold appear on top. Yield: 1 – 1/2 cups or more shrub syrup. To serve: In a glass with ice, combine 1 – 2 tbsp. 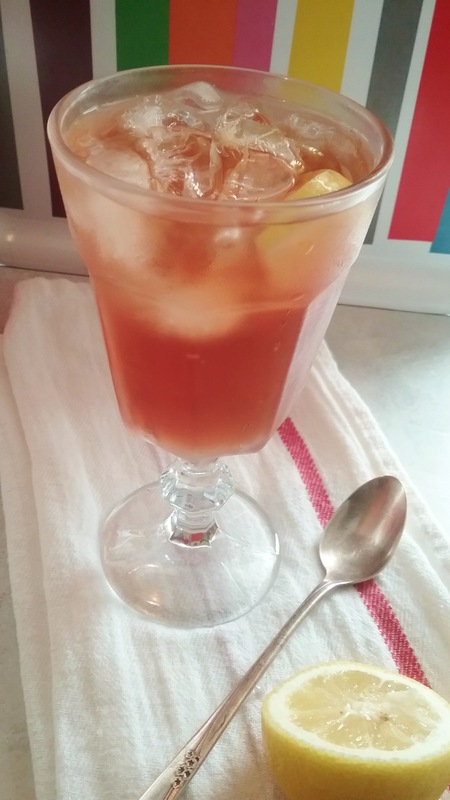 shrub syrup with still, soda, or sparkling water. Adjust to your liking and garnish with lemon.